This midseason potato salad is a perfect add to the Easter lunch table. It’s crunchy, zesty and super nutrient-dense. The chimichurri in this recipe is one of my go to sauces and I’m sure it will become yours. It is super easy, packed full of flavour and is high in iron thanks to its super green ingredients. This recipe will leave you with some extra to keep in the fridge – you can thank me later. Peeling the potatoes in not necessary as the skin gets nice and crunchy during the roasting process (and who has the time? ), and roasting the potatoes with the gochugaru is optional, although highly recommended if you are a fan of spice. It can be found at most asian grocers. And if you’re not cooking with hemp seeds yet, now is your chance. They can be sprinkled on top of anything as a garnish and are naturally rich in omega 3 fatty acids, protein, zinc and magnesium. Preheat oven to 180C degrees. Place quartered potatoes into a saucepan and fill with cold water until all potatoes are submerged. Cooking on medium high heat, bring the potatoes to a rolling boil. Once the water is boiling poke a potato with a sharpe knife. If the knife is inserted easily then they are done – if not just keep cooking for a little while longer, checking every few minutes until soft. Drain potatoes into a pasta strainer and give them a good toss – this will rough the edges up a bit which makes for a more crispy end product. Place the potatoes on a large baking tray. Drizzle with olive oil, sprinkle on the gochugaru and season with a pinch of salt. Use your hands to toss the taters, making sure everything is evenly coated. Bake the potatoes for 45 minutes. While the potatoes are baking de-stem your kale. This is easiest if you turn it upside down and run your fingers down the stem in a pinching motion. 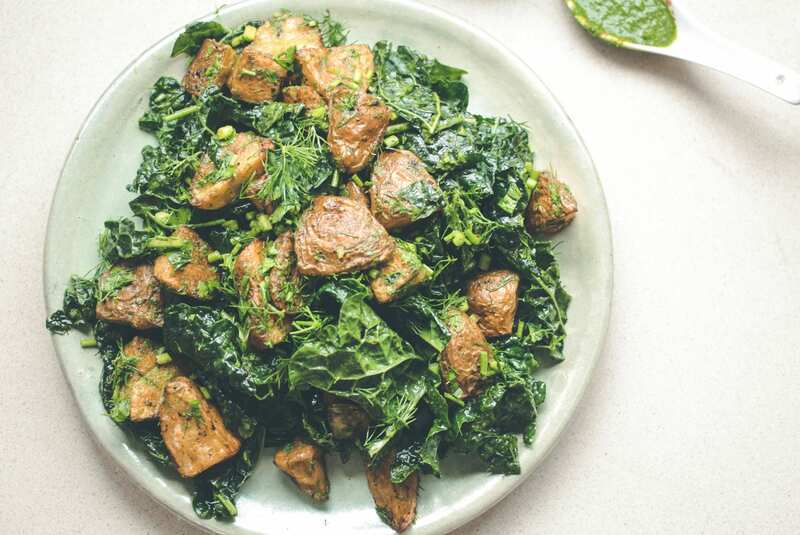 Place the kale in a bowl, sprinkle with a little salt and drizzle with olive oil. Using your hands toss the salad and massage the oil and salt into the kale – kale tastes so much better once you give it a little tender love and care. Chop up your dill, stalks and all, and add into the kale bowl. Add olive oil, garlic and apple cider vinegar into the blender and blitz until everything is combined. If it is too thick add a tiny bit of water to thin it out a bit. Once the potatoes are done take them out of the oven and allow them to cool slightly. Add the potatoes to the salad mix. Add half of the chimichurri to the salad mix and toss everything to coat evenly. Dish it up on a nice serving plate. Sprinkle on the hemp seeds, black sesame and spring onions. Serve immediately for a full crunch effect.